Note that phone and tablet GPSs may not work under the biggest redwoods or in steep canyons. This map covers the Santa Cruz Mountains from the outskirts of Saratoga and Los Gatos to the Pacific coastline around Point Ano Nuevo. Castle Rock, Big Basin, Portola, Butano, and Ano Nuevo State Parks are fully covered, as are many regional parks of the South Skyline Boulevard area, such as Fremont Older Open Space Preserve, Upper Stevens Creek County Park, Sanborn County Park, and El Sereno Open Space Preserve. 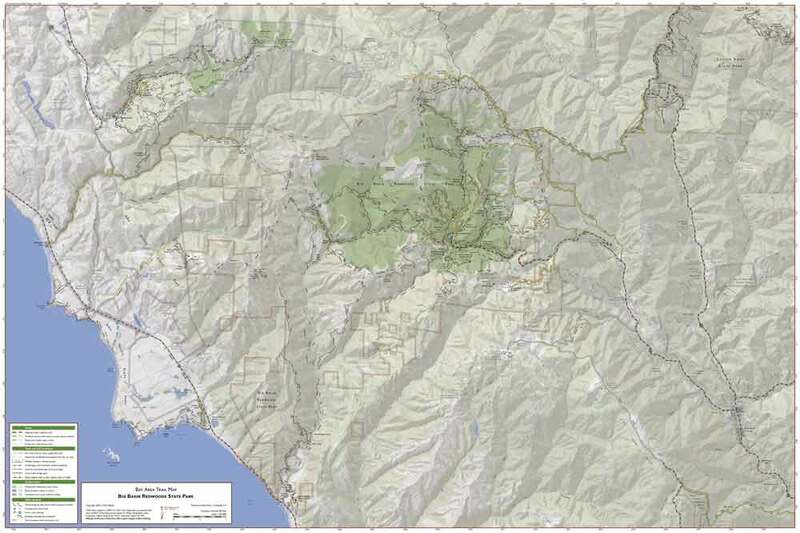 The map includes the entire Skyline-to-the-Sea Trail. 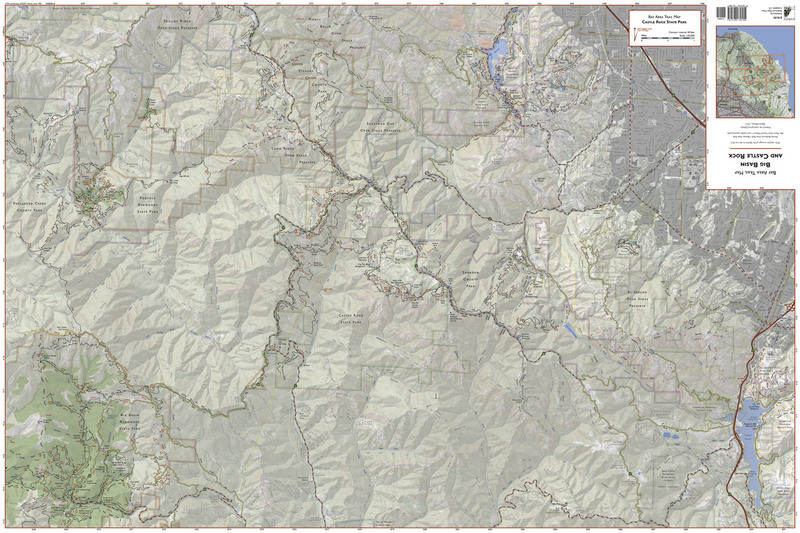 All official hiking trails were drawn from GPS data with a resolution of about 100 feet. Trail mileages are marked and most streets are labeled. To help you keep track of your location, the map shows the locations of memorial grove markers, footbridges, panoramic viewpoints, and stairs. 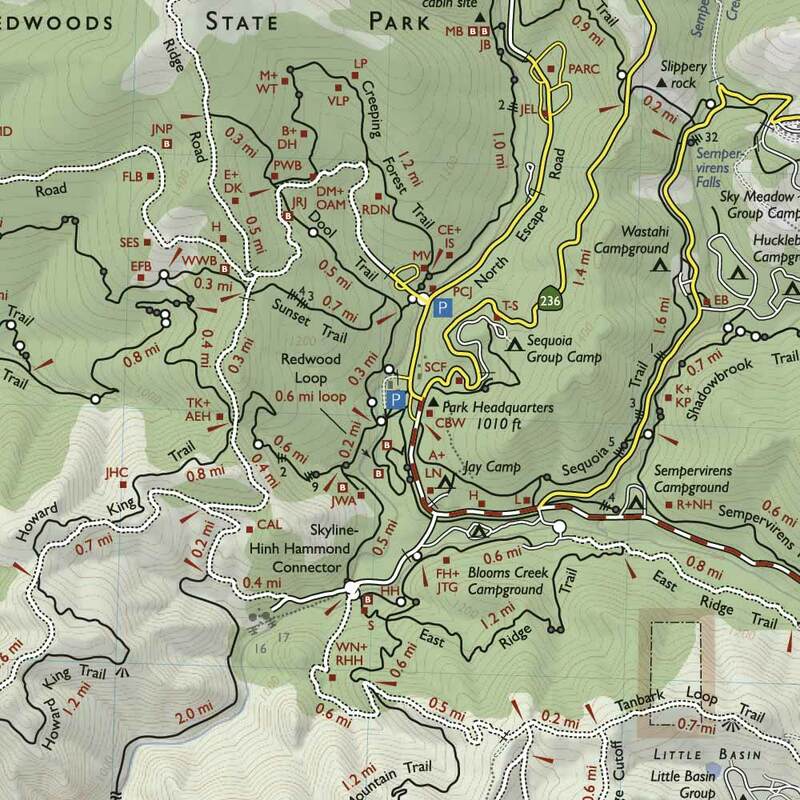 Unofficial trails and dirt roads are shown and are greyed out to distinguish them from official hiking trails. We don’t recommend that you use these trails, but if you accidentally wander onto one, having it on the map will help you get back on track. Areas of old-growth redwoods are shaded in dark green, wooded areas in light green, and developed areas in grey. A UTM grid is provided to help with GPS navigation.